Business as usual in Gaza as it begins exporting agricultural products to Europe, with Israel's assistance. Gaza began exporting agricultural products to markets in Europe on Sunday, following extensive work that was done by the Coordinator of Government Activities in Judea and Samaria (COGAT) Major General Eitan Dangot, along with officials in the international community and merchants from Gaza. In addition, preliminary meetings were held in the Coordination and Liaison Administration at the Erez Border Crossing. The meetings were aimed at streamlining the export procedure. 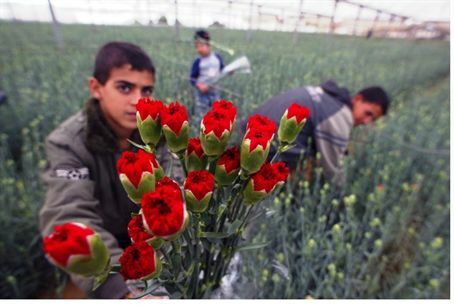 Gaza also began its export of strawberries and carnations to Europe, as part of an extensive project financed by the Dutch government. A spokesperson for COGAT stressed on Sunday that that Israel would continue to pursue export from Gaza, as part of an economic-civilian policy undertaken by the Israeli government. A military source said that Gaza is expected to export about 150 tons of cherry tomatoes, 50 tons of peppers, 1,000 tons of strawberries and 20 million carnations. Recently it was announced that, in addition to the agricultural exports, Gaza will soon be able to export furniture to Europe as part of a new pilot program. Israel allows exporting from Gaza despite rocket attacks by Gaza terrorists at Israel’s southern communities. Gaza’s Hamas terrorist rulers often claim that there is a humanitarian crisis in the area, which they claim is caused by Israel’s naval blockade in Gaza. Despite those claims, a huge luxury mall was opened last year, and several months ago Gaza even exported aid to Somalia.